Pre-heat oven to 350 °F (175 °C). Melt butter and pour into large bowl. Add bananas and mash. Add grated zucchini and shredded carrots. Mix well. Add sugar, beaten egg, and vanilla. Sprinkle in baking soda and salt and mix. Add flour and mix well. Pour in 4x8" loaf pan or two muffin trays (6 large each). Makes 1 loaf or 12 large muffins. Bake loaf for 60-75 minutes. 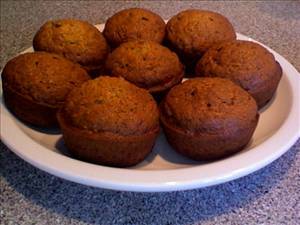 Bake muffins for approx 20-30 minutes. Let cool on tray and serve. There are 223 calories in 1 serving of Banana Zucchini Carrot Bread. Calorie split: 23% fat, 71% carbs, 6% protein. A quick, tasty, vegetarian recipe for sloppy joes.